RPS Evans-Hamilton (RPS EHI) has a reputation for excellence in physical oceanography services, meteorological conditions studies, and other water-related measurements in often difficult environments all over the world. For more than 40 years RPS EHI has been dedicated to solving environmental problems in coastal and deep-water environments as well as inland rivers and lakes, through the use of both classical and innovative data acquisition systems, modern data analysis techniques, and focus on customer needs, and attention to detail. 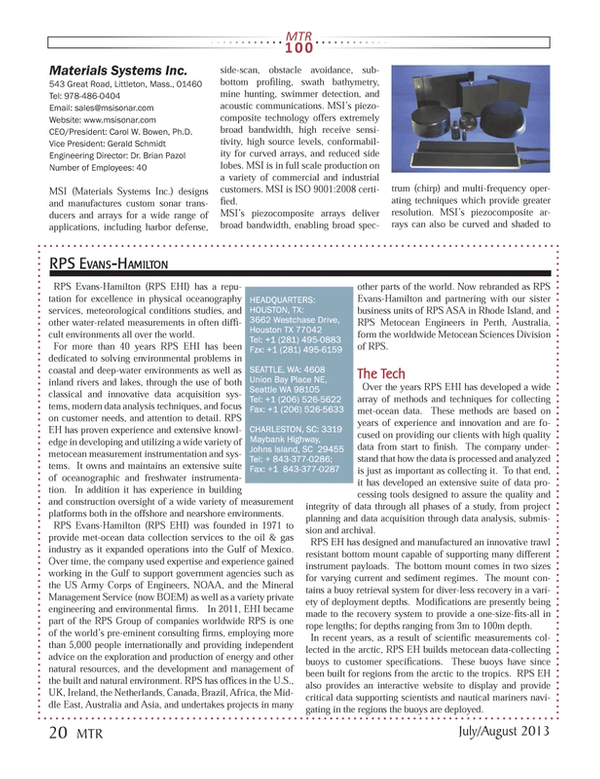 RPS EH has proven experience and extensive knowledge in developing and utilizing a wide variety of metocean measurement instrumentation and systems. It owns and maintains an extensive suite of oceanographic and freshwater instrumentation. In addition it has experience in building and construction oversight of a wide variety of measurement platforms both in the offshore and nearshore environments. RPS Evans-Hamilton (RPS EHI) was founded in 1971 to provide met-ocean data collection services to the oil & gas industry as it expanded operations into the Gulf of Mexico. Over time, the company used expertise and experience gained working in the Gulf to support government agencies such as the US Army Corps of Engineers, NOAA, and the Mineral Management Service (now BOEM) as well as a variety private engineering and environmental firms. In 2011, EHI became part of the RPS Group of companies worldwide RPS is one of the world’s pre-eminent consulting firms, employing more than 5,000 people internationally and providing independent advice on the exploration and production of energy and other natural resources, and the development and management of the built and natural environment. RPS has offices in the U.S., U.K., Ireland, the Netherlands, Canada, Brazil, Africa, the Middle East, Australia and Asia, and undertakes projects in many other parts of the world. Now rebranded as RPS Evans-Hamilton and partnering with our sister business units of RPS ASA in Rhode Island, and RPS Metocean Engineers in Perth, Australia, form the worldwide Metocean Sciences Division of RPS. Over the years RPS EHI has developed a wide array of methods and techniques for collecting met-ocean data. These methods are based on years of experience and innovation and are focused on providing our clients with high quality data from start to finish. The company understand that how the data is processed and analyzed is just as important as collecting it. To that end, it has developed an extensive suite of data processing tools designed to assure the quality and integrity of data through all phases of a study, from project planning and data acquisition through data analysis, submission and archival. RPS EH has designed and manufactured an innovative trawl resistant bottom mount capable of supporting many different instrument payloads. The bottom mount comes in two sizes for varying current and sediment regimes. The mount contains a buoy retrieval system for diver-less recovery in a variety of deployment depths. Modifications are presently being made to the recovery system to provide a one-size-fits-all in rope lengths; for depths ranging from 3m to 100m depth. In recent years, as a result of scientific measurements collected in the arctic, RPS EH builds metocean data-collecting buoys to customer specifications. These buoys have since been built for regions from the arctic to the tropics. RPS EH also provides an interactive website to display and provide critical data supporting scientists and nautical mariners navigating in the regions the buoys are deployed.